I am interested in amphibian and reptile habitat use. I am also interested in habitat restoration as it applies to the conservation and management of wildlife populations. 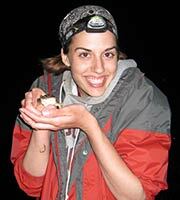 I am studying the migration and habitat use of Crawfish Frogs (Lithobates areolatus). I surgically implanted transmitters in a subset of a population and I am tracking them from the breeding wetlands to the crayfish burrows where they spend the summer and winter. Heemeyer, J.L. and M.J. Lannoo. 2012. Breeding migrations in Crawfish Frogs (Lithobates areolatus): Long-distance movements, burrow philopatry, and mortality in a near-threatened species. Copeia 2012:440-450. Heemeyer, J.L., P.J. Williams, and M.J. Lannoo. 2012. Obligate crayfish burrow use and core habitat requirements of Crawfish Frogs. Journal of Wildlife Management 76:1081:1091. Heemeyer, J.L. and M.J. Lannoo. Lithobates areolatus circulosus (Northern Crawfish Frog). Winterkill. Herpetological Review. 42:261-262. Hoffman, A.S., J.L. Heemeyer, P.J. Williams, J.R. Robb, D.R. Karns, V.C. Kinney, N.J. Engbrecht, and M.J. Lannoo. 2010. Strong Site Fidelity and a Variety of Imaging Techniques Reveal Around-the-clock and Extended Activity Patterns in Crawfish Frogs (Lithobates areolatus). Bioscience. 60: 829-834. Heemeyer, J.L., J.G. Palis, M.J. Lannoo. 2010. Lithobates areolatus circulosus (Northern Crawfish Frog). Predation. Herpetological Review. 41:475. Engbrecht, N.J., and J.L. Heemeyer. 2010. Lithobates areolatus circulosus (Northern Crawfish Frog). Heterodon platyrhinos (Eastern Hog-nosed Snake). Predation. Herpetological Review 41(2): 197. Heemeyer, J.L., and M.J. Lannoo. 2010. A New Technique for Capturing Burrow-Dwelling Anurans. Herpetological Review 41(2): 168–170. Lannoo, M.J., V.C. Kinney, J.L. Heemeyer, N.J. Engbrecht. 2009. Mine spoil prairies expand critical habitat for endangered and threatened amphibian and reptile species. Diversity 1: 118–132. Heemeyer, J.L., J.A. Homyack and C.A. Haas. 2007. Retention and readability of visible implant elastomer marks in the eastern Red-Backed salamanders Plethodon cinereus. Herpetological Review 38 (4): 425–428. Heemeyer, J.L. and M.J. Lannoo. Post breeding migration and habitat selection of the Crawfish Frog (Lithobates areolatus). Indiana State University Research Symposium, Terre Haute, IN. Heemeyer, J.L. and M.J. Lannoo. Post breeding migration and habitat selection of the Crawfish Frog (Lithobates areolatus). Southeastern Partners in Amphibian and Reptile Conservation (SEPARC) Annual Meeting, Altoona, FL. Heemeyer, J.L. Post breeding migration and habitat selection of the Crawfish Frog (Lithobates areolatus). Indiana State University Student Chapter of the Wildlife Society, Terre Haute, IN. Heemeyer, J.L. Post breeding migration and habitat selection of the Crawfish Frog (Lithobates areolatus). Indiana Academy of Science Fall Meeting, Indiana University-Kokomo, Kokomo, IN. Heemeyer, J.L. and P. Laver. A Field Survey of Herpetile Species in the Northern Limpopo Province. The Virginia Tech Undergraduate Research Symposium, Blacksburg, VA.
Heemeyer, J.L. and P. Laver. A Field Study To Confirm The Herpetile Species Distribution In The Northern Limpopo Province. Mogalakwena Lodge Staff, Alldays, Limpopo Province, South Africa. Heemeyer, J.L., J. Homyack, and C. Haas. Evaluation Of Visible Implant Elastomer in Red-Backed Salamanders (Plethodon cinereus). Virginia Herpetological Society, Longwood, VA.